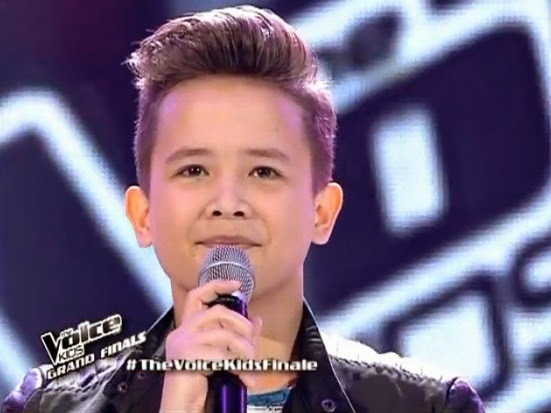 Manila, Philippines - Team Bamboo's young artist Juan Karlos Labajo sang 'Eto Na Naman' during the grand finale duet round of ABS-CBN's hit singing competition 'The Voice Kids' Philippines on Sunday, July 27, 2014 at the Resorts World Manila, Newport City, Pasay City. The 13-year old Cebuano charmer performed a duet song with Mr. Pure Energy Gary Valenciano. "That was so fun to watch. JK good job. Thank you for listening to me. Why JK should win as the grand champion? Hindi sa taas ng boses. It hard to find someone who knows the song," Coach Bamboo said to his artist. WATCH: The Voice Kids Philippines Grand Finale "Eto Na Naman" by Juan Karlos Labajo and Gary Valenciano (video). Aside from Juan Karlos, other artists aiming for the title are Team Lea's Darlene Vibares and Team Sarah’s Lyca Gairanod and Darren Espanto. Text VOICE JK and send to 2331 for ABS-CBN Mobile, Globe, TM and Sun Cellular subscribers and 231 for Smart and Talk 'N Text subscribers. The tariff is P1.00/vote for ABS-CBN Mobile, P2.50/vote for Globe, TM, Smart and Talk 'N text and P2.00/vote for Sun Cellular subscribers. Note: One vote per artist per SIM per round only. To vote online, go to http://thevoice.abs-cbn.com/vote. Log-in using valid email account. Enter PIN code of your ABS-CBN vote card and select name of artist (JK). Tariff is P5 per vote. Note: 5 votes per artist per email account per day only. The finale episode on Sunday tops online conversations with '#TheVoiceKidsChampion', 'You Are My Song' '#TVKDarrenForTheChampion' and '#WowAngGwapoNiLuis' among the trending topics.